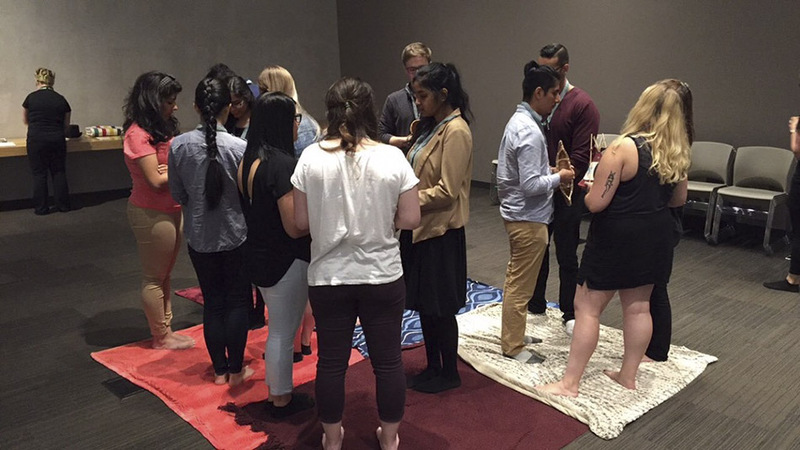 A group of McMaster students recently spent three days at Winnipeg’s Canadian Museum for Human Rights thanks to generous support from the Asper Foundation. The students – members of the History/Peace Studies class Human Rights in History – were among the first to take part in the Museum’s special programming aimed at university students. The group spent a number of days at the Museum, touring exhibits on subjects like indigenous and women’s rights, the Holocaust, the Rwandan genocide, the Underground Railroad and more. The students also had the opportunity to interact with Museum curators, who discussed best practices in communicating and translating information about human rights to the general public. They also met with a group of local alumni, who visited the Museum and chatted with the students over dinner. The trip was the first step in a two-year pilot that will see more students travel to Winnipeg next summer. The Asper Foundation brings students of all ages to the Museum as part of its Human Rights and Holocaust Studies program, which promotes respect for others and teaches about the consequences of racism. A group of McMaster students recently spent three days at Winnipeg’s Canadian Museum for Human Rights thanks to generous support from the Asper Foundation. The students – members of the History/Peace Studies class Human Rights in History – were among the first to take part in the Museum’s special programming aimed at university students. The group spent a number of days at the Museum, touring exhibits on subjects like indigenous and women’s rights, the Holocaust, the Rwandan genocide, the Underground Railroad and more. “These are subjects that I can teach, and I do teach, in class, but that the Museum can really help bring alive,” says course instructor Jennifer Tunnicliffe. “When you go to a place like the Museum the stories behind human rights issues become that much more personal.” The students also had the opportunity to interact with Museum curators, who discussed best practices in communicating and translating information about human rights to the general public. They also met with a group of local alumni, who visited the Museum and chatted with the students over dinner. “The students got so much out of the trip,” says Tunnicliffe. “It was really an invaluable experience.” The trip was the first step in a two-year pilot that will see more students travel to Winnipeg next summer. The Asper Foundation brings students of all ages to the Museum as part of its Human Rights and Holocaust Studies program, which promotes respect for others and teaches about the consequences of racism.